Medha Patkar is an Indian social activist who is known for her Narmada Bachao Andolan movement. She with other members of NAPM including Anna Hazare, filed a petition in the Bombay high court against Lavasa on behalf of the public interest.She was born on 1st December 1954 in Mumbai in Maharashtra. Her parents are Indu and Vasant Khanolkar. Both of them were political and social activists. Her father is an Indian freedom fighter. Her mother served as a member of Swadar that was started to assist suffering women. Her philosophical views were shaped by her parents. She finished her M. A. in social work from Tata Institute of Social Sciences. She is fighting for two decades against the construction of rising reservoir waters of Sardar Sarovar Dam. She has received many honors and awards for her social contributions. She is mentioned in the book by Jacques Leslie Deep Water: The Epic Struggle Over Dams, Displaced People, and the Environment. She received Right Livelihood Award for the year 1991. In 1999 she got M. A. Thomas National Human Rights Award given by Vigil India Movement. 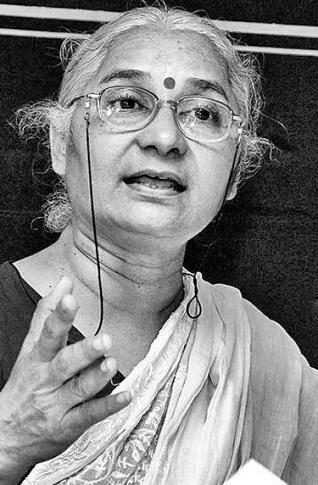 She got Deena Nath Mangeshkar Award, Mahatma Phule Award, Goldman Environment Prize, and Green Ribbon Award for Best International Political Campaigner by BBC and Human Rights Defender’s Award from Amnesty International. She was made as the Commissioner to the World Commission on Dams.She was criticized for not participating in the Jaitapur Nuclear Power Project. She was employed in TATA EMPIRE earlier. Still she drove out the Tata Nano plant from Singur in West Bengal. Though she fought for the people of Lavasa, it was found in an analysis that 90% of the Lavasa villagers are against her.